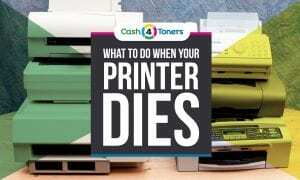 What To Do When Your Printer Dies? Sell Your Toner & Ink For Cash! It’s hard to understand, and even harder to talk about, but printers die, often before their time, usually in the middle of a print job. Argh! Noooo! The first thing you should do when your printer dies unexpectedly is get rid of your old supplies. Get cash for your toner! 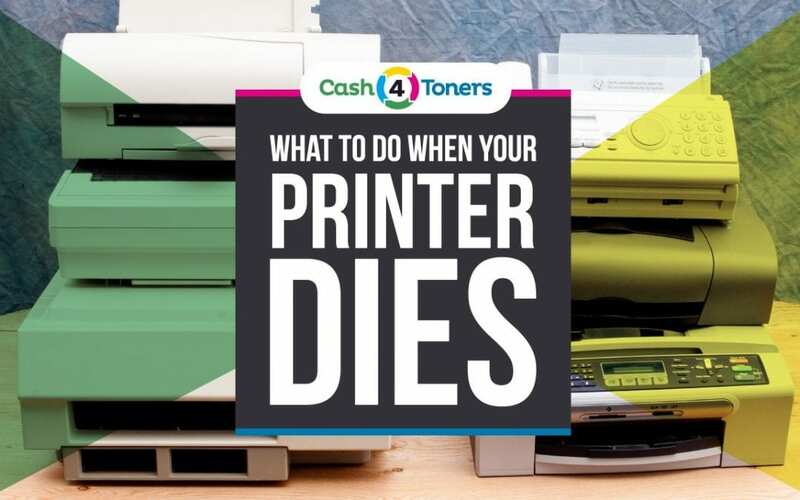 Not only is this an important part of the grieving process, but you can put cash in your pocket by selling those unused, surplus toner cartridges. Especially ink cartridges! Those things have a pretty short shelf life, so sell them to a buyback company before they’re worthless! Before you buy a new printer, sell your surplus toner from your old printer. Accepting the death of your beloved printer is a process not unlike the Kübler-Ross stages of grief. You’ll deny your printer’s death, (“No! This can’t be happening!”), and get angry about it, (“You $%@# piece of @#$@# machine!”). You’ll bargain with your printer, (“Come on, finish printing the page, at least!”), and may experience a bout of depression, (“This printer was barely two years old….*sniff*…”). But eventually you’ll reach a stage of acceptance — your printer’s dead, and it’s not coming back. Take a deep breath. It’s time to dispose of physical remains, which is never pretty. What do you do with a dead printer? Sick and twisted individuals find all kinds of creative ways to desecrate dead printers. We believe you can tell a lot about a society by the way it treats its dead printers, and we choose a more humane and civilized method of disposal. The most common way of disposing of your old printer is through recycling. Contact a local facility that specializes in computer peripherals. They might charge a small fee for the service, but professionals will safely remove any toxic items from the printer, and recycle every possible part. Your township or municipality may also have a scheduled electronic waste collection pick-up or disposal center…check your town website or the notices at city hall. The plastic housing and printed circuits of your dead printer pose a threat to the environment, and most states have strict rules against dumping printers in the trash. You don’t want your ink and toner cartridges ending up in landfills either. The environmental impact of improperly disposing of printers is substantial, reports the European Printing Ink Association. Recycling begins on the home front, and if you work in a business with the same printer model throughout the offices, it might be worth keeping that dead printer around for spare parts. Reusable printer parts include toners, drums, paper supports, output tray extensions….even the printed circuit board (PCB). Don’t toss it…cannibalize it! You may also be able to donate your dead printer to charity. Some facilities collect, repair and donate printers to nonprofit organizations and other institutions. In return, you get a tax write-off, and your old printer doesn’t end up in a landfill. Dead printers — like dead computers, scanners, monitors, and other peripherals — must be recycled. Potentially toxic materials are used in the construction of modern electronics, which pose an environmental threat. Do the right thing and dispose of your dead printer properly.